Photo by Steve Prillwitz Matchless Antiques. These vises are a late 20th Century pattern made by/for Brooks or Vaughn/Brooks of England and were sold in the U.S. by Centaur Forge. In the mid 80's they sold for $1400 in the U.S. Jaws are marked "4L 1/2" The paint appears to be Brooks blue. This vise has an inventive threaded on leg which reduces the size of the parts and makes it more compact for shipping. 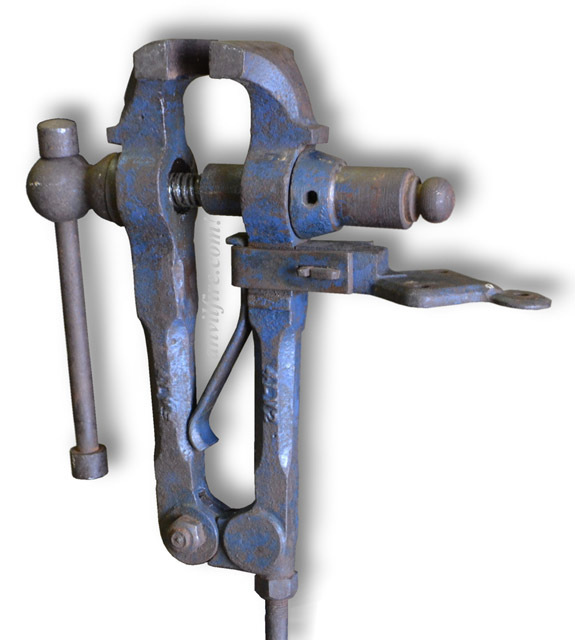 The general style of this vise is not very English (heavy duck tails, blocky jaws, handle with cylindrical knobs) thus it may have been produced in Eastern Europe. The later versions used a U-bolt and angle bench bracket similar to German and other European vises.